With the start of a new year, I decided to do some cleaning in my scrapbook room. It’s really amazing what you can find sometimes! I found these embellishments that I had made and hadn’t used yet. Then I saw the Mojo Monday sketch and thought I would just use them up right away instead of stashing them away! For that last card, I needed some more color than the scraps I was working with and couldn’t find (or don’t have any more) of the Superhero papers. You will never guess where that tiny piece of Sky-colored star paper came from!….the Believe Christmas paper!! I just love Close to My Heart’s double-sided paper for reasons like this. It was just what I was looking for! Buy 9 Studio J layouts, get the 10th one free. Below are my layouts and notes on anything I changed. I did not order the workshop kit on this one. 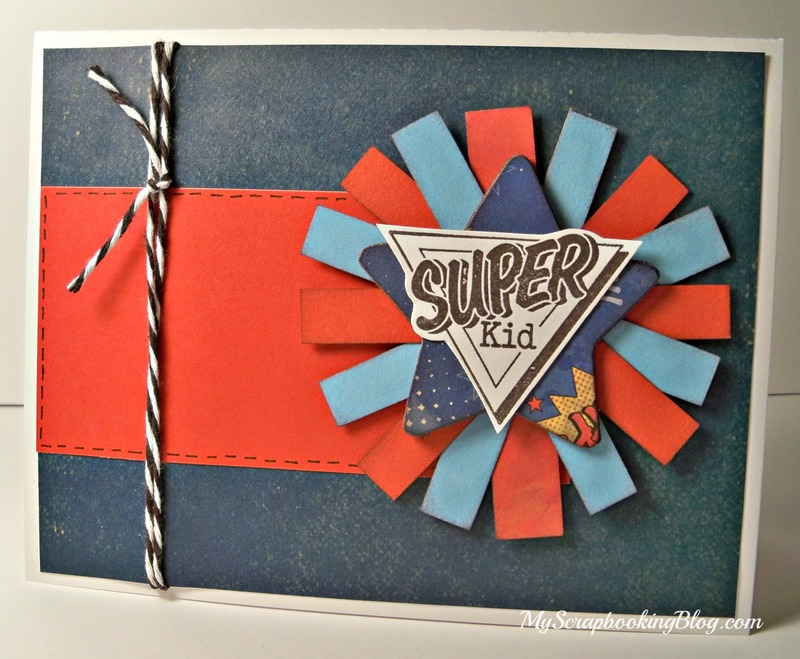 I just ordered the paper pack and used my own supplies to create the layouts. One note if you do this is that you will most likely need extra cardstock (note that all the workshops come with extra neutral cardstock). I switched up the papers on this one and I used the grey as the background for the second page and cut the striped paper at 1 1/2″ x 12″ (this also saves on paper). I rotated the second page to fit my photos. I used the Typeset stamp set which is retired but if you are one of my club members you most likely have this one in your stash! Notice that I staggered the letters of Brave in my title. This is a great option if you need to shorten your title or have a hard time lining the letters up straight. I did use black hemp…so glad to wrap it around the page and almost have it all used up. It was difficult to make a bow look right so I just did a knot. I prefer waxy flax. I used the square studs instead of the round. Other options would be black/grey sparkles, black assortment, or slate assortment. Welcome to another Art Philosophy Blog Hop. This month we will be showcasing the “Card” feature of the cartridge. Did you know there are 100 different card shapes you can make with this cartridge? You heard me correctly — 100!!! Now we won’t be able to show you ALL 100 card options, but we will show you as many as we can. The blog makes a circle so you can start anywhere and continue until you are back to where you started. If you are coming from Connie’s Blog, you are on the right path. 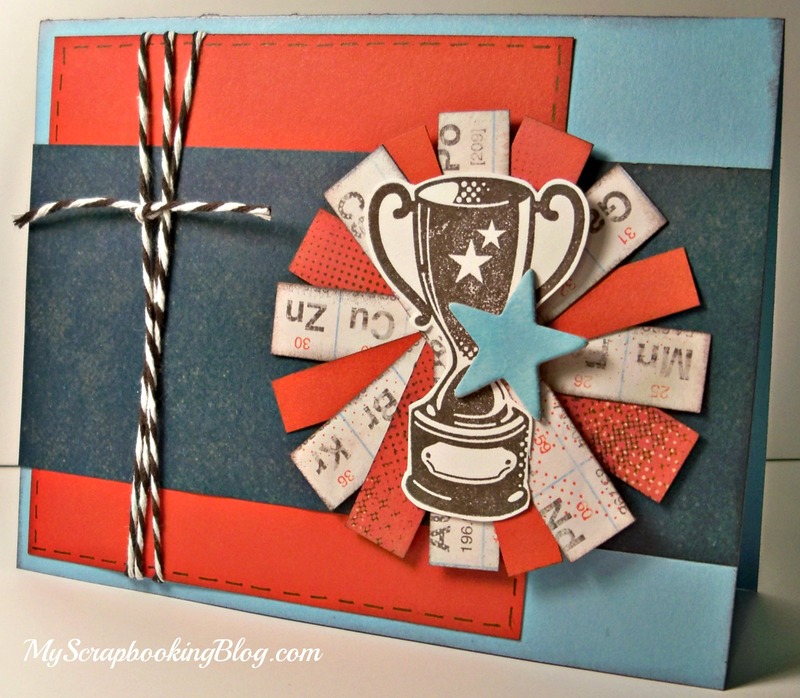 Lucy Kelleher, our hostess and fellow CTMH Consultant, will be giving away a stamp set!! She is giving away the April 2012 Stamp of the Month set that can no longer be purchased called “You are…” (Retail Value $17.95) You can see a picture of the stamp set on Lucy’s blog. To enter to win you must comment on Lucy’s blog and all the blogs in this blog hop. Supplies used are all Close to My Heart: Dotty For You Paper Packet, Art Philosophy Cricut Collection, Baker’s Twine Paradise Assortment, Sparkles, Party Pennants stamp set and Black ink. I chose the card feature on page 65 of the Art Philosophy booklet with the shift key. 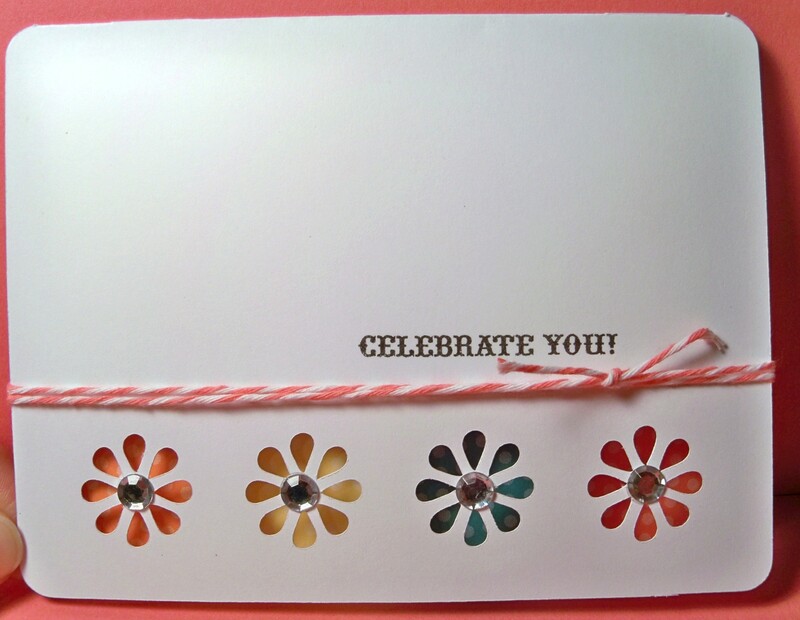 I used my 1 1/4 circle punch for circles which show through the front of the card to color the flowers. 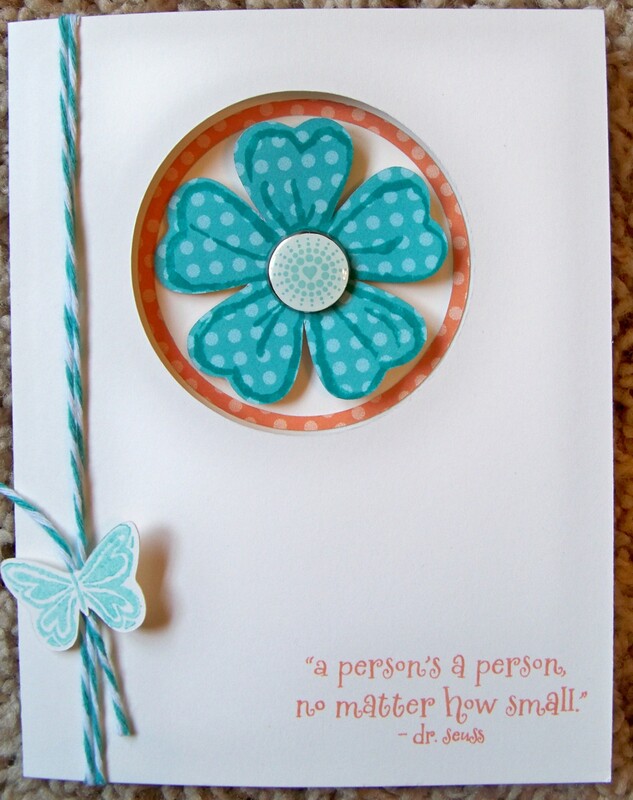 It is so easy to create amazing simple cards like this one with Art Philosophy. Your next stop is Joanne’s Blog. (C1486 Lucy ) This set is sold exclusively as part of the Lucy Workshop on the Go. I really love these workshops. They come with all coordinating products (a paper packet, a C-size stamp set, and embellishments as well as an instruction booklet. After you have used the workshop to is max, you will still have the stamp set forever to use on many more projects. I just love the girly pink colors of this paper but I wanted to show you another look with the same stamp set. 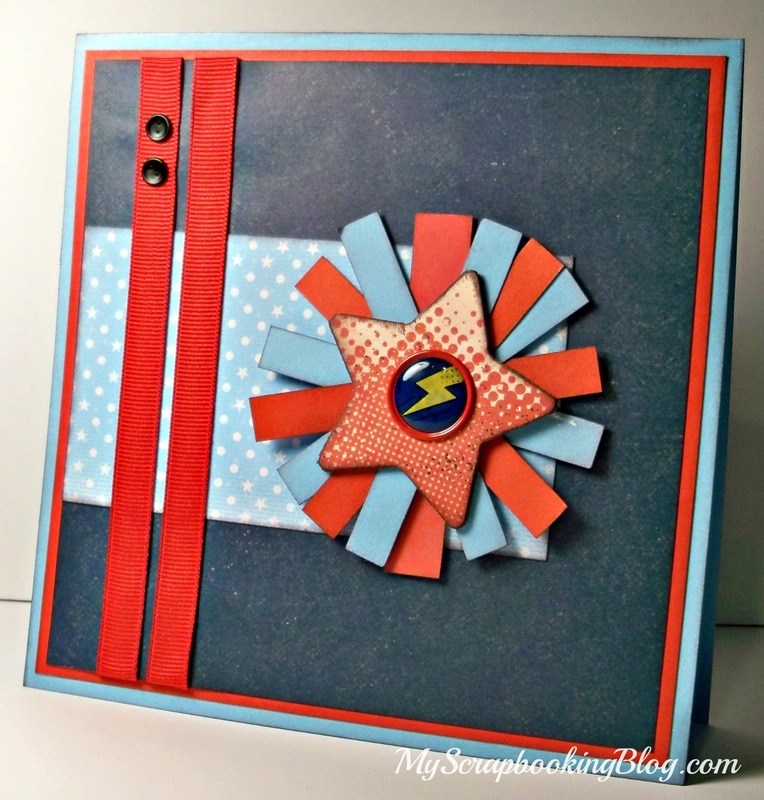 I really liked this card from Jeanette Lynton’s blog and changed it up to make it my own. Supplies used are all Close to My Heart unless noted: Lucy Workshop on the Go stamp set, Baker’s Twine, Art Philosophy Cricut Collection, Lagoon ink, Sunset ink, Liquid Glass, Dotty For You paper packet (June special), DCWV Baby Boy Jumbo Brads, and Creative Memories cutting system. I had to get my Creative Memories cutting system out for this one. It’s been forever since I’ve used it but it sure made it easy to create this window card. I also forgot just how much Baker’s Twine comes on one card. I’m going to have to use this more often. I was going to add some sparkles to this card and was looking through my box of rhinestones and found a package of brads (not where they were supposed to be) that I liked better than my original plan. I used Liquid Glass to attach the stamped butterfly to the twine so that it won’t come off but will still have movement. 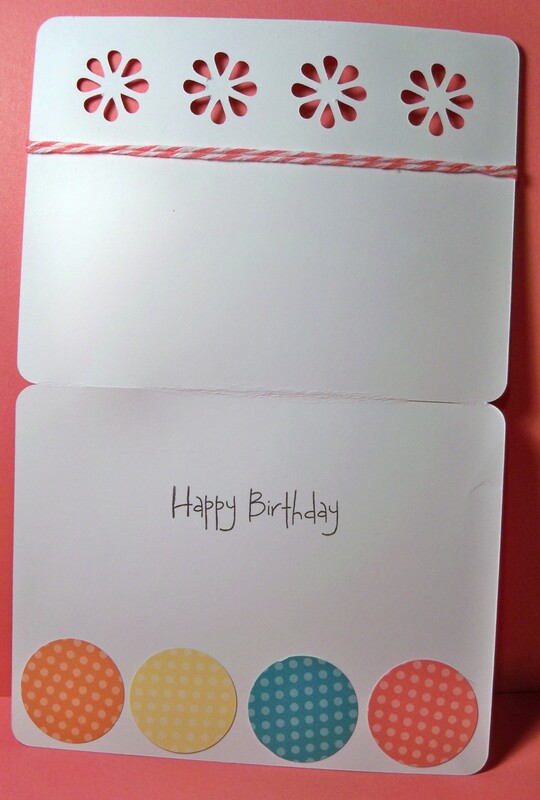 I think this card will make a nice non-traditional baby card or a birthday card for a little one.